Coco by Envy is a short, glamorous do with lots of Hollywood waves, a 100% hand-tied monofilament part and a lace front! - Front: 8.75", Crown: 9.25", Sides: 7.25", Nape: 3.75"
Embrace that retro glam look in this bouncy, mid-length "lob." Coco's artfully curled layers add a touch of flirty sophistication and the 100% hand-tied lace front and monofilament part construction offers oodles of stylability. Comes in Envy's beautiful highlighted and rooted colors! HAIR MAIL happy day! I have worn Envy Kimberley in cinnamon raisin for my day to day work hair for years. It has the perfect density, length and it last forever. I love it but it gets boring. I have been looking for a wavy/curly style to interchange. Coco fills all the boxes for me. The density is on the lighter side which is perfect for me. This is the only wavy style that I won't have thin and I've tried a lot. The curls dont take over my face. The lace front does what it should. I am so happy with this one. I love the coco wig by Envy. I am enjoying my envy wigs. To date I have purchased three. My head is on the smaller side of average, and many wigs that look great on everyone else look overwhelming on me. Coco is just the right amount of hair and the waves are bouncy without looking doll-like. The Dark Red color is fabulous, and now I'm thinking I want some more styles in this color. I deduct one star, though, for the skimpy side coverage. If you have biohair, I would not recommend getting this wig in a color that won't blend well with your sideburns. 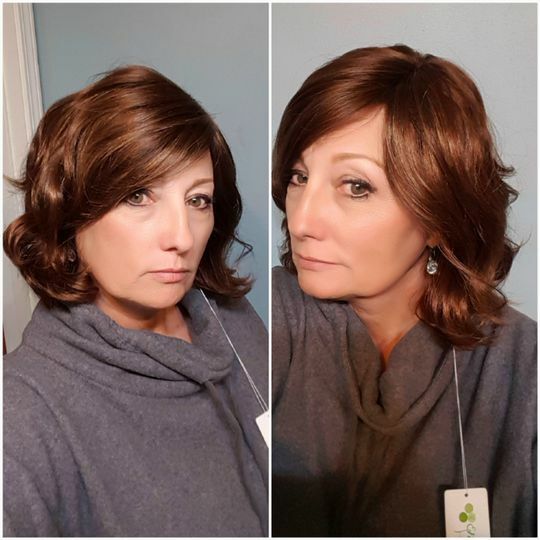 Carmen G. Reviewed by Carmen G.
This wig is a loss to me. I asked for average cap, this wig to me is a small. It did not fit my head. Angie G. Reviewed by Angie G.
This is a cute wig. You have to love permatease because it has a lot. There is also a lot of hair so if you don’t have much you may be a little shocked. For a synthetic wig the fibers don’t have a lot of shine so it’s very realistic. The color is beautiful for a brunette that doesn’t have any red tones or ashiness. The fit is a true medium that fits well. The wire in the ear tabs is on the flimsy side so you have to be careful. All in all a beautiful wig.